Another collection of original Ska from Heartbeat. All tracks produced by Duke Reid from his Treasure Isle label. Five tracks previously unreleased on CD and 6 unreleased tracks. The usual high quality recordings, as we have come to expect from Heartbeat, apart from "Koo Koo Ko" by Stranger Cole with Owen and Leon Silvera, sounds like its been dubbed from the record. Two well known hits are on the compilation starting us off with "Don De Lion" by Don Drummond. Baba Brooks Band with "Independence Ska" originally issued on Island records in the summer of 1965. Lynn Taitt has been credited for his guitar percussion according to the Soloists On The Songs list. 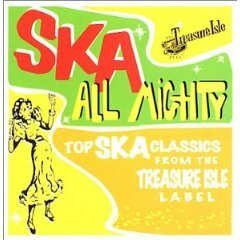 Some very nice Ska tunes check out "Why Should I Worry" and "Red Gal Ring". Notes by Chris Wilson which concentrate on the Jamaican Sound Systems. Issued on Heartbeat HBCD 7617.